Hypochlorous acid is a weak acid with the chemical formula HClO. 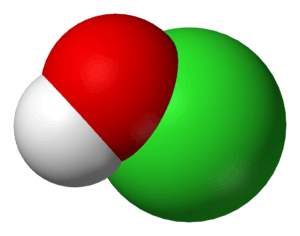 It forms when chlorine dissolves in water, and itself partially dissociates in water, into hypochlorite (-) and hydronium ions. It is HClO and OCl- that are the primary agents for disinfection when chlorine is used to disinfect water for human use. It cannot be isolated in pure form due to rapid equilibration with its precursor. HClO is an oxidizer, and in its sodium salt form sodium hypochlorite (NaClO), or in its calcium salt form calcium hypochlorite (Ca(ClO)2), can be used as a bleach, a deodorant, and a disinfectant. In the cosmetics industry it is used as a skin cleansing agent, which benefits the body's skin rather than causing drying. It is also used in baby products, because baby skin is particularly sensitive and can be easily irritated. Escherichia coli exposed to hypochlorous acid lose viability in less than 0.1 seconds due to inactivation of many vital systems. Hypochlorous acid has a reported LD50 of 0.0104–0.156 ppm and 2.6 ppm caused 100% growth inhibition in 5 minutes. However it should be noted that the concentration required for bactericidal activity is also highly dependent on bacterial concentration. HOCl is known to cause post-translational modifications to proteins, the notable ones being cysteine and methionine oxidation. A recent examination of HOCl's bactericidal role revealed it to be a potent inducer of protein aggregation. Hsp33, a chaperone known to be activated by oxidative heat stress, protects bacteria from the effects of HOCl by acting as a holdase, effectively preventing protein aggregation. Strains of E. coli and Vibrio cholerae lacking Hsp33 were rendered especially sensitive to HOCl. Hsp33 protected many essential proteins from aggregation and inactivation due to HOCl, which is a probable mediator of HOCl's bactericidal effects. HOCl is a strong oxidizer. ↑ Harris, Daniel C. (2009). Exploring Chemical Analysis (Fourth ed.). p. 538. ↑ Sansebastiano, G. et al. Page 262 in Food Safety: A Practical and Case Study Approach (Ed: R. J. Marshall) 2006, Springer Science & Business Media, Berlin. ↑ Harrison, J. E.; J. Schultz (1976). "Studies on the chlorinating activity of myeloperoxidase". Journal of Biological Chemistry. 251 (5): 1371–1374. PMID 176150. 1 2 3 Thomas, E. L. (1979). "Myeloperoxidase, hydrogen peroxide, chloride antimicrobial system: Nitrogen-chlorine derivatives of bacterial components in bactericidal action against Escherichia coli". Infect. Immun. 23 (2): 522–531. PMC 414195 . PMID 217834. ↑ "Disinfection of Facility H2O". ↑ "Water Works: Hyatt's New Disinfectant/Cleaner Comes from the Tap", Bloomberg Businessweek. ↑ Jacangelo, J. G., and V. P. Olivieri. 1984. Aspects of the mode of action of monochloramine. In R. L. Jolley, R. J. Bull, W. P. Davis, S. Katz, M. H. Roberts, Jr., and V. A. Jacobs (ed. ), Water Chlorination, vol. 5. Lewis Publishers, Inc., Williamsburg. 1 2 3 4 5 Prütz, WA (1998). "Interactions of hypochlorous acid with pyrimidine nucleotides, and secondary reactions of chlorinated pyrimidines with GSH, NADH, and other substrates.". Archives of Biochemistry and Biophysics. 349 (1): 183–91. doi:10.1006/abbi.1997.0440. PMID 9439597. 1 2 3 Arnhold, J; Panasenko, OM; Schiller, J; Vladimirov, YuA; Arnold, K (1995). "The action of hypochlorous acid on phosphatidylcholine liposomes in dependence on the content of double bonds. Stoichiometry and NMR analysis.". Chemistry and physics of lipids. 78 (1): 55–64. doi:10.1016/0009-3084(95)02484-Z. PMID 8521532. 1 2 3 Carr, AC; Van Den Berg, JJ; Winterbourn, CC (1996). "Chlorination of cholesterol in cell membranes by hypochlorous acid". Archives of Biochemistry and Biophysics. 332 (1): 63–9. doi:10.1006/abbi.1996.0317. PMID 8806710. 1 2 Carr, AC; Vissers, MC; Domigan, NM; Winterbourn, CC (1997). "Modification of red cell membrane lipids by hypochlorous acid and haemolysis by preformed lipid chlorohydrins". Redox report : communications in free radical research. 3 (5–6): 263–71. PMID 9754324. 1 2 3 Hazen, SL; Hsu, FF; Duffin, K; Heinecke, JW (1996). "Molecular chlorine generated by the myeloperoxidase-hydrogen peroxide-chloride system of phagocytes converts low density lipoprotein cholesterol into a family of chlorinated sterols". The Journal of Biological Chemistry. 271 (38): 23080–8. doi:10.1074/jbc.271.38.23080. PMID 8798498. ↑ Vissers, MC; Carr, AC; Chapman, AL (1998). "Comparison of human red cell lysis by hypochlorous and hypobromous acids: insights into the mechanism of lysis". The Biochemical Journal. 330 (1): 131–8. doi:10.1042/bj3300131. PMC 1219118 . PMID 9461501. 1 2 Vissers, MC; Stern, A; Kuypers, F; Van Den Berg, J; Winterbourn, CC (1994). "Membrane changes associated with lysis of red blood cells by hypochlorous acid". Free radical biology & medicine. 16 (6): 703–12. doi:10.1016/0891-5849(94)90185-6. PMID 8070673. ↑ Winterbourn, CC; Van Den Berg, JJ; Roitman, E; Kuypers, FA (1992). "Chlorohydrin formation from unsaturated fatty acids reacted with hypochlorous acid". Archives of Biochemistry and Biophysics. 296 (2): 547–55. doi:10.1016/0003-9861(92)90609-Z. PMID 1321589. 1 2 3 Albrich, JM; Hurst, JK (1982). "Oxidative inactivation of Escherichia coli by hypochlorous acid. Rates and differentiation of respiratory from other reaction sites". FEBS Letters. 144 (1): 157–61. doi:10.1016/0014-5793(82)80591-7. PMID 6286355. 1 2 3 4 Barrette Jr, WC; Hannum, DM; Wheeler, WD; Hurst, JK (1989). "General mechanism for the bacterial toxicity of hypochlorous acid: abolition of ATP production". Biochemistry. 28 (23): 9172–8. doi:10.1021/bi00449a032. PMID 2557918. 1 2 3 Jacangelo, J; Olivieri, V; Kawata, K (1987). "Oxidation of sulfhydryl groups by monochloramine". Water Research. 21 (11): 1339–1344. doi:10.1016/0043-1354(87)90007-8. 1 2 3 4 5 Knox, WE; Stumpf, PK; Green, DE; Auerbach, VH (1948). "The Inhibition of Sulfhydryl Enzymes as the Basis of the Bactericidal Action of Chlorine". Journal of Bacteriology. 55 (4): 451–8. PMC 518466 . PMID 16561477. ↑ Vissers, MC; Winterbourn, CC (1991). "Oxidative damage to fibronectin. I. The effects of the neutrophil myeloperoxidase system and HOCl". Archives of Biochemistry and Biophysics. 285 (1): 53–9. doi:10.1016/0003-9861(91)90327-F. PMID 1846732. 1 2 3 Winterbourn, CC (1985). "Comparative reactivities of various biological compounds with myeloperoxidase-hydrogen peroxide-chloride, and similarity of the oxidant to hypochlorite". Biochimica et Biophysica Acta. 840 (2): 204–10. doi:10.1016/0304-4165(85)90120-5. PMID 2986713. 1 2 Pereira, WE; Hoyano, Y; Summons, RE; Bacon, VA; Duffield, AM (1973). "Chlorination studies. II. The reaction of aqueous hypochlorous acid with alpha-amino acids and dipeptides". Biochimica et Biophysica Acta. 313 (1): 170–80. doi:10.1016/0304-4165(73)90198-0. PMID 4745674. 1 2 3 McKenna, SM; Davies, KJ (1988). "The inhibition of bacterial growth by hypochlorous acid. Possible role in the bactericidal activity of phagocytes". The Biochemical Journal. 254 (3): 685–92. doi:10.1042/bj2540685. PMC 1135139 . PMID 2848494. ↑ Hazen, SL; D'avignon, A; Anderson, MM; Hsu, FF; Heinecke, JW (1998). "Human neutrophils employ the myeloperoxidase-hydrogen peroxide-chloride system to oxidize alpha-amino acids to a family of reactive aldehydes. Mechanistic studies identifying labile intermediates along the reaction pathway". The Journal of Biological Chemistry. 273 (9): 4997–5005. doi:10.1074/jbc.273.9.4997. PMID 9478947. 1 2 3 4 5 Prütz, WA (1996). "Hypochlorous acid interactions with thiols, nucleotides, DNA, and other biological substrates". Archives of Biochemistry and Biophysics. 332 (1): 110–20. doi:10.1006/abbi.1996.0322. PMID 8806715. ↑ Rakita, RM; Michel, BR; Rosen, H (1990). "Differential inactivation of Escherichia coli membrane dehydrogenases by a myeloperoxidase-mediated antimicrobial system". Biochemistry. 29 (4): 1075–80. doi:10.1021/bi00456a033. PMID 1692736. 1 2 Rakita, RM; Michel, BR; Rosen, H (1989). "Myeloperoxidase-mediated inhibition of microbial respiration: damage to Escherichia coli ubiquinol oxidase". Biochemistry. 28 (7): 3031–6. doi:10.1021/bi00433a044. PMID 2545243. ↑ Rosen, H.; S. J. Klebanoff (1985). "Oxidation of microbial iron-sulfur centers by the myeloperoxidase-H2O2-halide antimicrobial system". Infect. Immun. 47 (3): 613–618. PMC 261335 . PMID 2982737. ↑ Chesney, JA; Eaton, JW; Mahoney Jr, JR (1996). "Bacterial glutathione: a sacrificial defense against chlorine compounds". Journal of Bacteriology. 178 (7): 2131–5. PMC 177915 . PMID 8606194. 1 2 3 Morris, J. C. (1966). "The acid ionization constant of HClO from 5 to 35 °". J. Phys. Chem. 70 (12): 3798–3805. doi:10.1021/j100884a007. 1 2 McFeters, GA; Camper, AK (1983). "Enumeration of indicator bacteria exposed to chlorine". Advances in Applied Microbiology. 29: 177–93. doi:10.1016/S0065-2164(08)70357-5. ISBN 978-0-12-002629-6. PMID 6650262. 1 2 3 Barrette Jr, WC; Albrich, JM; Hurst, JK (1987). "Hypochlorous acid-promoted loss of metabolic energy in Escherichia coli". Infection and immunity. 55 (10): 2518–25. PMC 260739 . PMID 2820883. ↑ Camper, AK; McFeters, GA (1979). "Chlorine injury and the enumeration of waterborne coliform bacteria". Applied and Environmental Microbiology. 37 (3): 633–41. PMC 243267 . PMID 378130. ↑ Venkobachar, C; Iyengar, L; Prabhakararao, A (1975). "Mechanism of disinfection☆". Water Research. 9: 119–124. doi:10.1016/0043-1354(75)90160-8. ↑ Hurst, JK; Barrette Jr, WC; Michel, BR; Rosen, H (1991). "Hypochlorous acid and myeloperoxidase-catalyzed oxidation of iron-sulfur clusters in bacterial respiratory dehydrogenases". European Journal of Biochemistry / FEBS. 202 (3): 1275–82. doi:10.1111/j.1432-1033.1991.tb16500.x. PMID 1662610. ↑ Rosen, H; Klebanoff, SJ (1982). "Oxidation of Escherichia coli iron centers by the myeloperoxidase-mediated microbicidal system". The Journal of Biological Chemistry. 257 (22): 13731–35. PMID 6292201. ↑ Rosen, H; Orman, J; Rakita, RM; Michel, BR; Vandevanter, DR (1990). "Loss of DNA-membrane interactions and cessation of DNA synthesis in myeloperoxidase-treated Escherichia coli". Proceedings of the National Academy of Sciences of the United States of America. 87 (24): 10048–52. doi:10.1073/pnas.87.24.10048. PMC 55312 . PMID 2175901. ↑ Rosen, H; Michel, BR; Vandevanter, DR; Hughes, JP (1998). "Differential effects of myeloperoxidase-derived oxidants on Escherichia coli DNA replication". Infection and immunity. 66 (6): 2655–9. PMC 108252 . PMID 9596730. ↑ Winter, J.; Ilbert, M.; Graf, P.C.F. ; Özcelik, D.; Jakob, U. (2008). "Bleach Activates a Redox-Regulated Chaperone by Oxidative Protein Unfolding". Cell. 135 (4): 691–701. doi:10.1016/j.cell.2008.09.024. PMC 2606091 . PMID 19013278. ↑ Wang L et al. "Hypochlorous acid as a potential wound care agent. Part I Stabilized hypochlorous acid: a component of the inorganic armamentarium of innate immunity". J Burns and Wounds 2007; April: 65–79. ↑ Robson MC et al. "Hypochlorous acid as a potential wound care agent. Part II Stabilized hypochlorous acid: its role in decreasing tissue bacterial bioburden and overcoming the inhibition of infection on wound healing". Journal of Burns and Wounds 2007; April: 80–90. ↑ Selkon, JB; et al. (2006). "Evaluation of hypochlorous acid washes in the treatment of venous leg ulcers". J Wound Care. 2006 (15): 33–37.